SPCA Auckland has partnered with Mini to promote adoption of rescued dogs with an integrated advertising campaign featuring three dogs who have learned to drive. Three SPCA dogs were taught to drive a Mini Countryman and showcase just how intelligent they are. The theory is that New Zealanders will be so inspired by the level of intelligence that they’ll be more likely to adopt an SPCA dog. Monty, Porter and Ginny were filmed over eight weeks as they trained for their world first demonstration on Monday 10 December live on NZ television show Campbell Live. 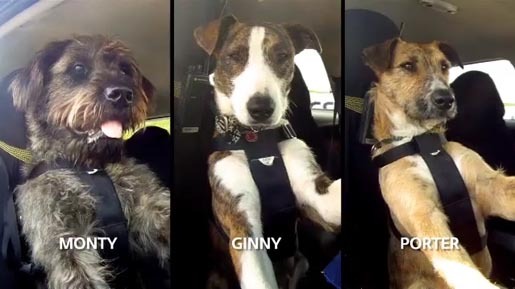 New Zealanders can meet Monty, Porter and Ginny, watch videos of the training, and find out about their local SPCA and check out some of the dogs up for adoption on a Facebook app drivingdogs.co.nz. 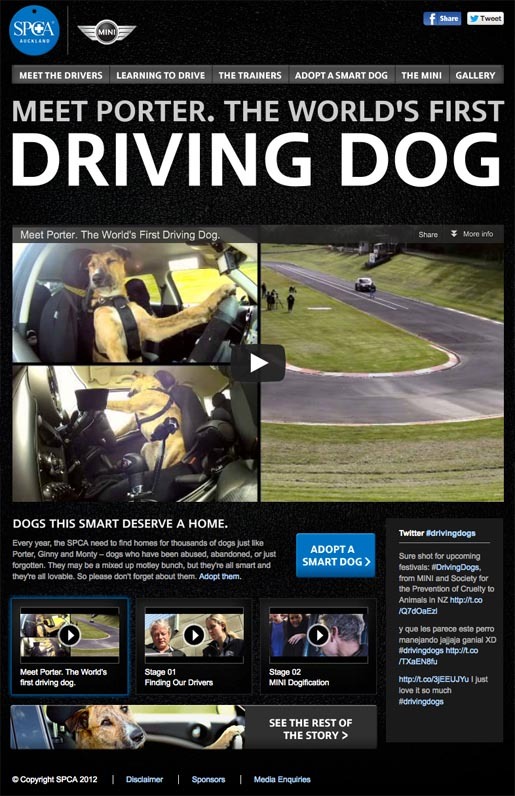 The Driving Dogs campaign campaign was developed at FCB New Zealand, Auckland, by executive creative director Regan Grafton and Tony Clewett, creatives Matt Williams and Peter Vegas, head of TV Esther Watkins, TV producer Sarah Yetton, senior motion graphics designer Marco Siraky, head of post production Blaire Walker, senior designer Nick McFarlane, senior interactive producer Kevin Aakers, interactive designer Catherine Chi, group account director Toby Sellers, account director Sally Willis, account manager Stephanie Huber, PR general manager Angela Spain, PR account manager Eloise Hay, media manager Rachel Leyland, communications planning director Rufus Chuter, general media manager Simon Teagle, media buyer Sarah McEwen, head of digital and content Harri Owen, senior digital media planner/buyer Steph Pearson. The dogs were trained by Mark Vette, Marie Manderson, Rosie Miles and Jazmin Vette-Dal Bello at Animals on Q. The Mini Countryman was modified for use by dogs at Ikon Engineering. Original music was by Liquid Studios.